Universal Storage Systems (SA) (Pty) Ltd manufactures, supplies and installs steel racking, shelving and mezzanine floors for commercial and industrial usage to meet any customer storage needs. U.S.S offers a fully integrated approach to users in any required field to efficiently store and retrieve materials on any nature, size, weight or format. Our secret lies in providing services no one else offers. We reinvent storage solutions to enhance space for any industry or person use. This integrated approach meets every requirement for both Industrial or Commercial steel storage. Through application of each of the encompassing elements. From our head offices in Strydom Park, Johannesburg; we offer storage solutions to both national and international markets. With branches in Cape Town, Durban, Port Elizabeth and Nelspruit; our dedicated agents and distributors take pride in the fact that across Southern Africa where U.S.S has been of service to major brand leaders within the country’s industry and commerce. Our enhanced network throughout Southern Africa and Sub-Saharan Africa is the leader in industrial and commercial, manufacturing and supplying of racking, shelving and mezzanine storage. 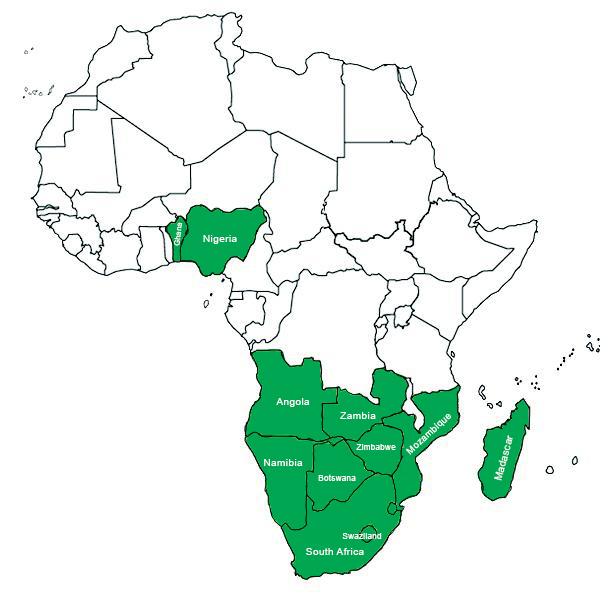 With distribution agents in Namibia, Botswana and Zimbabwe, as well as U.S.S own reach into Sub-Saharan Africa with projects in Angola, Botswana, Ghana, Kenya, Nigeria among others. U.S.S will be there wherever you do your business in Africa. Find all you steel racking, shelving and mezzanine flooring. 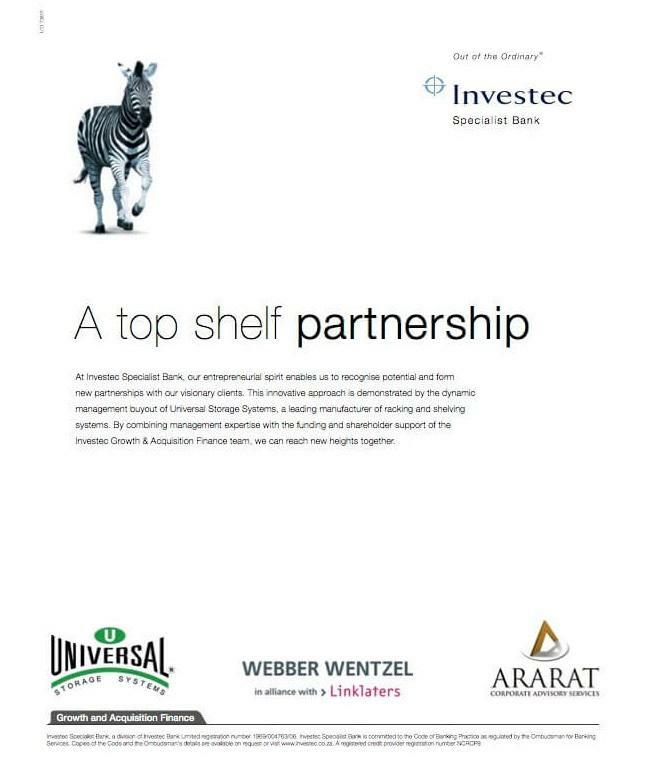 With over 20 years’ experience in the manufacture, supply and installation of steel racking, shelving and mezzanines, Universal is a long-standing brand with over 10 trademarked products, and a dedication to quality service. It is through this experience and a belief in total quality control that has ensured. Universal Storage Systems understand that Africa will continue to grow and eventually fully emerge as the next economic frontier. It is with this belief in Africa that has spurred Universal into ever expanding into other parts of Africa. Universal recognizes the need for the supply of quality and cost-effective storage solutions both for existing clients and prospective clients. Whether your business is based in Africa or you are wishing to expand into Africa, Universal Storage Systems is there for you, wherever you do business. Universal Storage Systems has a proven track record of doing business in Africa and have completed numerous projects throughout the African continent. Such as Nigeria, Ghana, Zambia, Mozambique and Kenya. Our projects have ranged from installing pallet racking and drive-in racking for a mining corporation in Ghana, to our current project providing racking and shelving for a multi-million rand distribution centre warehouse in Kenya, for a South Africa-based pharmaceuticals company. Our African footprint also includes distributors in Namibia, Botswana and Zimbabwe. Universal is accredited by the SADC (The Southern African Development Community) and provides a SADC certificate with all our exports.